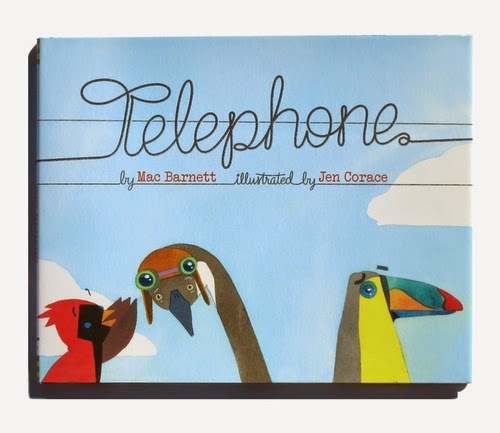 Telephone, written by Mac Barnett and illustrated by Jen Corace (two of my absolute favorites) is one of those books that makes you wonder why no one has jumped on this idea before. It's also one of those deceptively simple picture books that has so much more going on. Taking the old game that kids still love to play as inspiration, Barnett sets the story in motion when a mother pigeon asks another young, baseball bat toting cardinal to tell her son Peter to "Fly home for dinner." The message passes from bird to bird, all sitting on a telephone wire, changing with each passing. Sharp observers will notice that the message changes to fit the interest of the bird passing it on and listeners will be increasingly amused by the silly iterations that occur. The story peaks when a hysterical pigeon passes the message to an owl, combining all of the craziness into one long, loopy missive. Wise and cool, the owl is unflappable. Even in the face of the pigeon's party blower, my favorite illustration. I love Corace's colorful, detailed illustrations. Besides following the message as it is passed down the wire, she includes background details that bring the message to life as well as action with the humans underneath the telephone wires, playing, reading cooking and getting ready for dinner. Mac Barnett's stories are always paired with the best of the best when it comes to illustrators, but I hope these two work together again soon on a picture book!